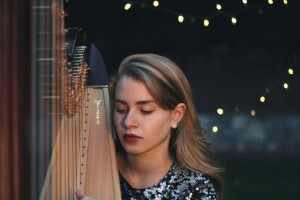 Alix is our harpist and joined us in January 2012. How did you come to join QUO? My teacher, Bridget Kibbey, was a musical colleague of Michael Vannoni, QUO’s former principal violist. QUO was looking for a harpist to play Rimsky-Korsakov’s Capriccio Espagnol harp cadenza. Bridget Kibbey recommended me and I was so excited for the opportunity. Though I am straight, QUO welcomed me with open arms! I have been QUO’s harpist now for 4 years and have loved every minute. What musical symbol best defines you and why? The musical symbol that best defines me is a fermata because I really hold onto ideas. I am a very determined, tenacious person who does not give up. I really hold onto my beliefs and dreams. How long have you been playing harp? I have been playing the harp for 13 years. I started when I was 8½! But really, I wanted to play the harp ever since I was five years old. It all started the first time I saw the Disney film The Aristocats. At the end of the movie, Duchess, the mother cat, plays this gorgeous harp cadenza. Since that moment, I was hooked. My parents had me taking piano lessons and I was completely uninspired by the actual keys, yet obsessed with lifting the lid of the grand piano and plucking the inner strings. I begged my parents for harp lessons and they agreed after three more years of piano. I think they were hoping I would forget. I remembered and my mom had to search for a harp teacher. The rest is history! Told you I was tenacious. 5Oh the adventures of harp cartage. As many people realize, a harp is not the easiest instrument to maneuver around. And in Manhattan, it is even more challenging. You can’t fit it in a cab, and you can’t take it on the subway. It doesn’t fit in your average vehicle either! As a harpist, you pretty much devote half of your time to driving your minivan and the other half begging people to hold the door for you. You become best friends with percussionists (big THANK YOU to QUO president, Andrew Berman!) and bassists because they understand your struggle and can give you a lift. Moving a harp is a challenge but is worth all the trouble and time. I love what I do. Support QUO with items from the QUO Gear Shop at Cafe Press!